Phrase by phrase response to a proposed Brand promise shows what phrases resonated with customers and non-customers. Showed what to emphasize in supporting communications depending on the target audience. Compared the strengths and weaknesses of the TV and Print Ads for delivering the message. Enabled the budget to be allocated more cost-effectively according to the objectives for the campaign. 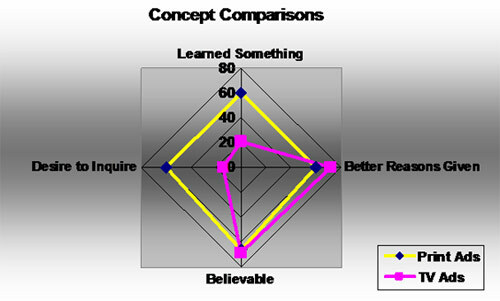 This analysis was conducted using additional measures, as well and compared among different audience segments. 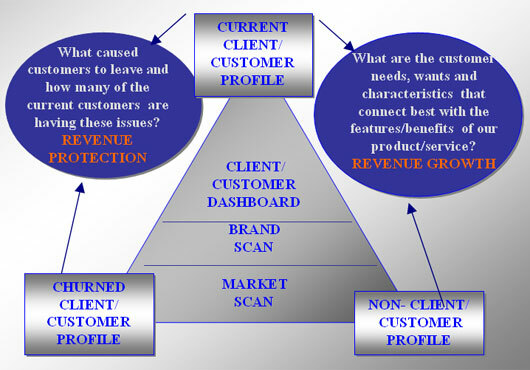 Triangulation audit among three different customer/non-customer groups. Those who had left were interviewed to provide insight on retaining the rest, in order to secure revenue through targeted improvements. New customers were compared to non-customers to identify commonalities and characteristics that could be leveraged to attract additional new customers. 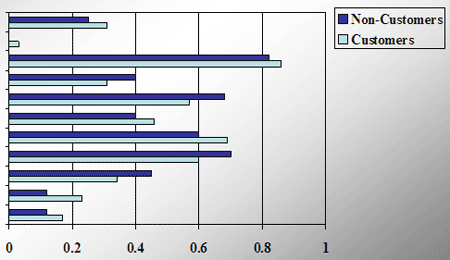 Showed revenue stability and risk based on clients’ perception of the company. 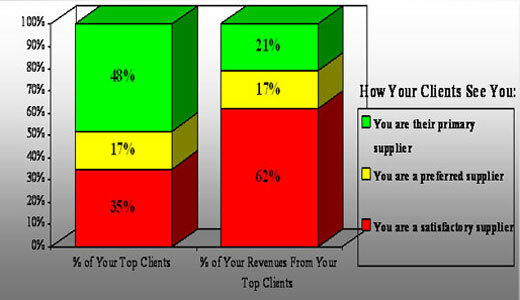 The clients who consider the company their main/primary supplier account for only 21% of the revenue, while the clients considering the company only satisfactory account for 62% of the revenue. ‘Satisfied’ clients are not committed clients, and represent a substantial percentage of revenue vulnerable to competitive overtures. Key action items were identified to build a stronger relationship with these clients, in order to secure the revenue.